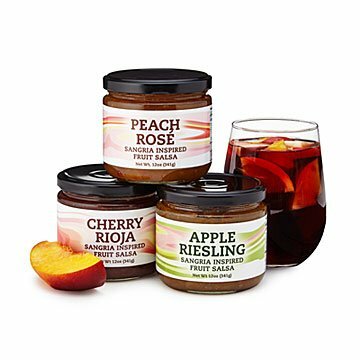 Salsa meets sangria in this set of wine-infused flavors: Cherry Rioja, Peach Rosé, and Apple Riesling. When ripe, sweet fruits meet lush, velvety wine something magical happens. It's called sangria, and we didn't think it could get any better. Add a few helpings of peppers and smattering of spices and you've got this collection of wine-infused salsas. (We stand corrected.) Each of the three flavors features a fruit traditionally used in sangria paired with a yummy wine: Cherry Rioja, Peach Rosé, and Apple Riesling. Try them with chips, cheese and crackers, or any savory dish to add a sweet and spicy kick. Made in Ohio.